Ask fellow campers about "Kentucky Splash Waterpark and Campground" and nearby attractions. Be aware once water park closes for season, this place is deserted, so much so that I was a little concerned about leaving our trailer unattended (but no problems). Other than one employee at check-in, we never saw another staff person (though bathrooms remained very clean and well attended so we may have just missed them). There was debris on site next to us for all 4 nights we stayed there so don't think anyone regularly goes around to check out the campground. 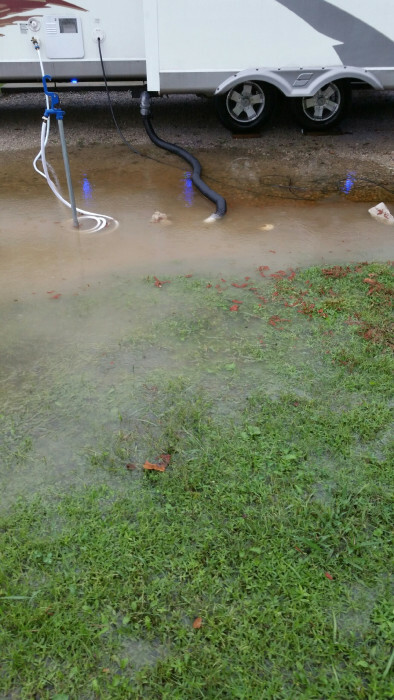 Bugs were more than awful and when we had a large rain storm we figured out why...drainage is very poor and takes hours to drain off and ground was soggy even the next day. Maybe during water park season it is more well attended. Pluses - large concrete pad and level gravel sites. Cable was mostly analog and very grainy but I won't know till next camping trip if it was our set or the campground. Very close to eateries and Walmart and interstate. NO shade at all, mostly a parking lot. We camped at Kentucky Splash Waterpark and Campground in a Travel Trailer. Camped here and went to Big South Fork railway for the scenic railway ride with lunch in Stearns, KY. FUN and got to take our little dog too. Next day went to Cumberland Falls State Park. That too was awesome. But after those 2 things that was about it within an hour's drive. Small campground but very nice, level, gravel sites. Camped during the off season of the water park so it was not full, but I imagine it is full during the summer months when the water park is open. All back in sites except for 1 pull through site. Made reservations online but then switched sites when we arrived to a site that had a better stream view. Fairly peaceful and quiet. We camped at Kentucky Splash Waterpark and Campground in a Motorhome. Rather than repeat what we have previously said, please see our earlier review of this campground July, 2015. Since this campground is small, only about 18 sites, during the summer months (June-August) you should plan on making a reservation as far ahead as possible as they fill up on weekends. The campground has recently added a really nice bath house adjacent to the campground, rather than having to go over to the water park facilities as in the past. Also, there is a full time campground host, an employee of the water park, on site. If you use satellite service we suggest that you review the park layout on Google Maps to select an appropriate site as there are very large/tall trees along the southern end of the campground. We really enjoy the spacious sites, peace and quiet and accommodating host, at this small park and will certainly plan on another stop over on our next trip up the nearby I-75 corridor. We camped at Kentucky Splash Waterpark and Campground in a Motorhome. There are several nearby restaurants as well as a Walmart. Great campground! So nice to stay here and visit the park. The camp host was very nice. Ask for a site that's in the middle. We stayed in the first site, and although it's a great campground, the site was right next to the parking lot for Kentucky Splash, so it was a bit loud at times. I would stay here time and time again if I lived closer. We camped at Kentucky Splash Waterpark and Campground in a Travel Trailer. Stoped for an overnight stay while traveling on S/B I-75. 1/2 mile to the interstate and a Wal-mart is nearby. Park is small and very clean, and it is at the far edge of the water park lot. All gravel back-in sites with 1 pull thru. $50 for the pull through, 35 for back in sites. This is nice for an overnite, and excellent if your kids are playing in the water park. 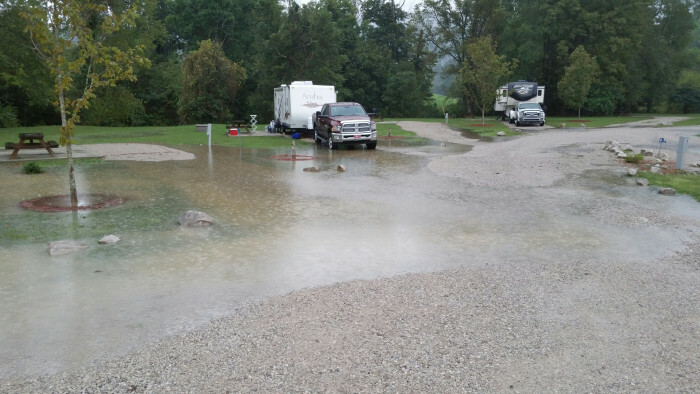 We camped at Kentucky Splash Waterpark and Campground in a Motorhome. In season, you are at the water park - release the kiddies! This is a new rv park at a water park. Easy access from the interstate. Extremely easy to navigate. Very clean, spacious and level. Will definitely stay here again. We camped at Kentucky Splash Waterpark and Campground in a Travel Trailer. This was our first visit to this RV park, and we were pleasantly surprised. There are long level gravel back-in sites with paved access roads. The grounds are nicely maintained, the hookups and WiFi were very good, and the staff were very friendly. The RV park is close to Cumberland Falls (about a 25 minute drive). The only negatives that I would note is that there is no recycling on site and there were many stinkbugs around that tried to invade our fifth wheel. We would definitely come back here if we were in the area. We camped at Kentucky Splash Waterpark and Campground in a Fifth Wheel. Take a side trip to Cumberland Falls. There is no charge to visit and it is a beautiful area. Easy to access from the interstate but signage could be better. Just stay in the right hand lane and turn right when it ends. The need a sign telling you where to register. We happened to meet the host who showed us where to go. Otherwise, you will need to pull up to the Water Park office to register and there are a lot of kids, people, cars to drive around. We had the only pull-through site so we paid more than the back-ins. Sites are well maintained gravel with patio and picnic tables. Nice playground for kids and, of course, the water park just across the parking lot. We would stay here again for an overnight stop. We camped at Kentucky Splash Waterpark and Campground in a Motorhome. We drove to Corbin to see the Harland Sanders museum, birthplace of KFC. It was interesting but not worth making the trip unless you're going to be in the area anyway. Stayed a couple nights. Unique campground on the public road across the parking lot at Kentucky Splash. Nice room with spots with good water sewer cable and wifi. Road noise is an issue and no real security or control on access. Vehicles in and out due to public access to creek, driving range, etc on same road. Bathrooms were fairly clean but small and could become overwhelmed if park was full. Buggy due to being on creek. Park host was nice and worked at KY Splash as well as running the campground. We camped at Kentucky Splash Waterpark and Campground in a Travel Trailer. Used as a launch point for KY Splash and Cumberland Falls. This was a great find on our way south. It has all back in sites that are the longest I've encountered. Pacing ours I came up with approx. 100 feet of hard packed small stone. Each site has a concrete patio, picnic table and campfire ring. The owner told me that he will have restroom facilities by next summer. We used Verizon for our wifi which worked very well. 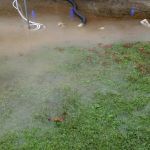 Water pressure was exceptional and older campers should be sure to use a pressure regulator. The water park is closed for the season so we had a very quiet stay. During the season the water park closes by 7:30 PM so nights are quiet. No trains close by. A state highway that the campground is located on can be a bit noisy during the day but is quiet at night. This will be a definite stop for us any time we go through the area. We camped at Kentucky Splash Waterpark and Campground in a Fifth Wheel. Near to a highway exit and town gives many shopping options. We went to the El Palenque for Mexican food and it was real good. This is a new RV park that just opened in May, 2015. It is part of the Williamsburg town owned Kentucky Splash Waterpark and Campground, but you can use the RV park without using the Splash park. The waterpark has existed for several years, but the campground has just been added. The campground consists of a single paved loop, with fairly level gravel sites accompanied by a concrete picnic table area. The sites are spacious and most are long enough to accommodate the longest RV's. Though the sites appear to be hard packed gravel/stone, we found that we had to place large jack pads under our leveling jacks to prevent the jacks from sinking into the gravel. Be aware that there is a small creek that runs along the back side of the RV sites. The night we were there, there was a significant rain storm and we were awakened to a weather radio alert to flooding risk. 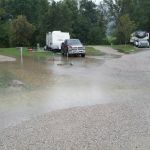 The small creek had turned into a raging river, and was within inches of overflowing the banks, which would have flooding the entire flat campground area. Needless to say we departed early heading for higher ground. In dryer weather this would certainly not be of concern. WiFi was on a par with most RV parks, slow and unreliable. Good AT&T and Verizon service. A Pilot, Walmart and several restaurants are just down the road right off I-75. Outside of the above rain concerns, the park is a nice, quiet, spacious and clean park and we will certainly use this as a stopover anytime we are passing through this area. And if you have anyone interested in the water park it is inexpensive and right across a large parking lot. We camped at Kentucky Splash Waterpark and Campground in a Motorhome. Cumberland Falls National and State parks are just a few miles to the north. The falls are worth seeing. Are you affiliated with Kentucky Splash Waterpark and Campground ?